For most of our local beekeepers, September is significant because it marks the beginning of the end for the regular honey season. Our Beekeepers in the South still have time left on the beekeeping clock, but our ‘keepers in the North are warming up for winter. However, as temperatures fall, we’re determined to keep one thing on the rise: honey awareness. And no better way to do that than with a celebration of National Honey Month! Throughout September, National Honey Month aims to promote American beekeeping, the industry itself, and, of course, all things local honey. It was started in 1989 by the National Honey Board as a way to not only support the beekeepers, but also to bring the benefits and importance of honey production more into the public eye. From our hives to your homes, honey has quite a long journey, and it all begins with the bee. Whether working in the hive or flying about, foraging for nectar in the fields, honey bees play an integral part in not only honey production, but agriculture as a whole. Pollination, while a seemingly simple task to most, is vital for the fertilization of plants and growing vegetables and fruit – all production of food sources. In fact, it’s estimated that one out of every three bites of food worldwide is a result of pollinators’ hard work. Put simply: Without bees, we wouldn’t have food, let alone delicious honey. So, what can we do to help during National Honey Month? Well, besides buying honey, which only furthers the growth of the industry, we can educate ourselves on the importance of pollinators, and spread awareness on those determined to protect it. 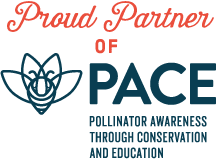 That’s why we partner with PACE, Pollinator Awareness through Conservation and Education, a global initiative led by Butterfly Pavilion to promote habitat and species conservation. In fact, a portion of proceeds from each Local Hive bottle sold goes toward the support of PACE. In honor of National Honey Month, we’ll be celebrating all things local honey on our Facebook. Every week, we’ll be selecting winners to receive a handmade basket filled with three honeys from the regions of your choosing, all of which can be found on our site. To enter to win, just go to our Facebook, “like” the post about the giveaway, and comment with the regions you’d love to try and we’ll pick a winner by the end of that day! The honey season may be coming to an end, but for those of us at Local Hive, things are just getting started. Follow us on social media to see all the exciting things we have in store, and visit your local store to see what it’s like to taste honey from your own backyard.